Purchased in 2004 and opened in 2008, the Legacy Trail is the area’s largest public recreation project ever. 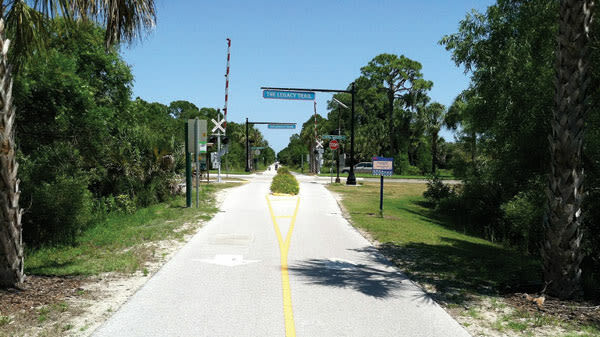 The 10.8-mile asphalt biking and walking pathway, part of the national “Rails to Trails” project, follows the former CSX railroad corridor from south Sarasota through Venice. Sarasota County is currently working to extend the trail northward to downtown Sarasota’s Payne Park. The seven trailheads, north to south, are located at the Culverhouse Nature Park on McIntosh Road in Sarasota, Osprey Junction, Laurel Park, Nokomis Community Park, Oscar Scherer State Park, Patriots Park and the Historic Venice Train Depot. In addition to being a haven for bicyclists and pedestrians, the smooth, continuously paved and car-free surface makes the trail a rare and lengthy oasis for roller blading, longboarding and other small-wheeled vehicles. Likewise, it’s wheelchair-friendly. Frequent rest areas, many of them covered, and informational kiosks give you a chance to catch your breath while learning about the area’s history and nature. Because the railroad tracks had relatively little impact on their surrounding environment, the trail thrusts you into unspoiled habitats teeming with Florida wildlife, including bobcats, otters, snakes, turtles and even Florida panthers. Acknowledge the trail’s railroad origins at the Historic Venice Train Depot, which was built in 1927 and now features a slew of historic artifacts—including a real red caboose from CSX Transportation. There are even docent-led tours. At the depot, its southernmost terminus, the Legacy Trail joins with the five-mile-long Venetian Waterway Park Trail, much of it running along the Intracoastal.